Do you know that a 20000mAh (or greater) power bank will keep you on the go for days? Now is the best time to say ‘enough’ to those sudden power cut or drain when you least expect it. High capacity power banks are remarkably handy. From portable charging around the home to mobile charging while traveling—your mobile devices will be ready for use anytime you want. 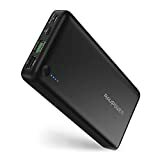 Below are the top 10 best 20000mAh power banks in 2019. Grab one now and make a mockery of the ‘wall socket’ for a while. For something that is sleek yet powerful, the Yee power bank is a ‘goto’ product. This is the power bank that gives you the courage to take your phone anywhere without worrying about electricity. Yee designed this power bank to carry a sizeable 20000mAh power capacity. With this, you can easily charge your iPhone 8 more than eight times over. If you have a Galaxy S6, this power bank charges it five times over. The better part is that it has an LCD screen indicator that informs you how much power you have left on the power bank. A4.1A dual port output allows you to charge two devices at a time. The dual port also charges faster without killing your time. I like the fact that this power bank also comes with a built-in safe charge system that prevents overcharge or discharge of the battery. It also keeps your device safe from short circuit and other types of damages. At 1.16 pounds, this is one of the most lightweight 20000mAh power banks in the market. Now, you can hit the outdoors in style and with confidence. Metecsmart brings you one of the most versatile and powerful power banks in the market. While the white color design looks beautiful, the real deal lies in the power charge base of this power bank. The Metecsmart power bank charger can charge up within 3 to 5 times as fast as possible. From your iPhone to galaxyS7, HTC, Motorola, and whatever device you may have, this power bank is equal to the challenge. Inside the power bank lays a solid Li-polymer battery cell. The power bank itself measures 6.3 x 3.0 x 0.87 inches in dimensions, making it a highly compact model. With less than 16 ounces in weight, you can easily carry it about anywhere in the outdoors. The Metecsmart power bank includes 1SV-2A input unit and two output ports ranging 2SV-3A and 12V-1.5A respectively. One USB cable is also included in the package, plus a user manual that tells in clear details on how to go about using it. Moreover, there is a 12 months warranty against any form of manufacturer defects. So, you have nothing to lose if you invest in this option. Power is everything that defines a power bank, and this one from LQM didn’t disappoint. 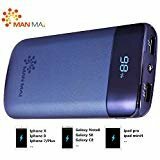 Whether you have an iPhone, iPad, HTC, AIR Mini, Samsung, and more, this power bank will charge it for you. You can plug in two devices and watch them charge at the same time. The 20000mAh power capacity charges up your device quickly. The design is ergonomic and is the perfect choice for traveling. You can comfortably use it where there is no electricity. Due to its portability, you can easily carry this power bank right inside your pocket without even noticing it. In between the dual ports lies a torch light that offers you visibility where there is little or no light. A USB cable for connecting to devices, including a single 20000mAh portable charger is also in the package. Now is the time you can conveniently charge up our tablets and phones while on the outdoors. The SOLICE is another ultra-high capacity portable battery charger. It works for almost all types of phones and tablet devices. It can charge up your iPhone 6 as much as 3.5 times over. If you have a Galaxy S2, this power bank can charge it at a range of 2.5 times and faster. However, if your device belongs to another category, SOLICE can get the job done multiple times faster. Looking at the charger’s body frame, you will see it is highly compact. It measures 3.2 x 0.9 x 6.3 in dimensions, which is just perfect. You don’t have to worry about much space in your bag assuming you’re traveling. It fits easily inside your computer bag or backpack. Two USB ports accompany the product, meaning you can easily charge two devices at the same time. One of the USB port has 1A charging output while the other has 2.1A output. It packs a lot of power for your device once it charges up. There is a LED light that makes things convenient when on the go or in the outdoors. By this, you will be able to know when the battery is fully charged. The unique features inside the power bank prevent short circuits and overcharging from damaging your device. The surface of the power bank features an anti-fingerprint design that prevents stains when handling it. 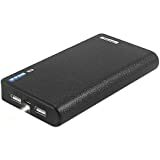 Here is another excellent large capacity power bank from KUPPET. Now is the perfect time to say goodbye to issues of power dying while on the outdoors. No matter where you are or where you may be, this is the power bank that guarantees you will keep in touch with reality using your device. The good thing about this power bank is that it can charge any device you throw at it. As long as your device is proper[y functioning, KUPPET can handle it. The LED display indicates what is going on with your device while charging. It also tells you about the capacity available inside the power bank itself. This tells you what to expect and how to plan for a particular outcome. At 3.1 x 6.1 x 0.9 inches in dimensions, this is one of the thinnest and portable power banks ever. You can easily slide it into your backpack or inside your computer bag without breaking a sweat. With this option, storage is never an issue. Another great feature inside this piece is the lithium-polymer battery cell. It composes of 10 different state-of-the-art intelligent IC components that protect your devices from overcharging. In addition, it guides your device against short circuit problems and overheating conditions. Faster charging is what this power bank is designed to do. The iMuto features a Qualcomm 3.0 Quick charge technology that is equivalent to 25watts of power. Once you connect this to your device, it will take very little time to charge. It charges up the battery 80% faster than most standard charges in the market. 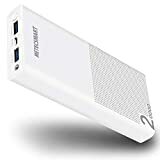 You can use the iMuto 20000mAh high capacity power bank with build-in A-class lithium battery. It supports a wide range of devices such as the new MacBook, which can charge for 1.9 times faster. It also supports iPhones, iPads and many more devices as well. Digi-Power features allow you to know the amount of battery life left on the bank. Just push the button and the remaining battery time will show up in digital format. Again, you can automatically adjust standby mode when not in use. There is a whole lot to benefit from using the iMuto power bank. Moreover, the power bank is capable of charging your iPhone 8 more than 8 times. The iM-Power feature enables your device to charge even faster. It will lock in on your device intelligence and speed up the charging process. Now, you know we have something serious here. You can try it for yourself. So you have an iPhone 8? It’s time to add 8 efficient charges to it. That is what the Poweradd power bank is offering you. 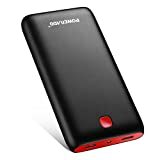 Appearing in black and red color design, the Poweradd is a massive capacity 20000mAh power bank. The unique aspect of this bank is the USB Smart Charging technology it incorporates. With it, the power bank will automatically detect and charge your device in a much faster speed up to 3.4A max. This is an upgrade on a previous model, and it features a built-in Li-Polymer battery cell. The difference is that this model is more lightweight and offers safe charging for all your devices. With the Pilot X7, you can get more than 500 charge circles. So, are you still convenient with this product? Well, if you’re not, then hear this: the Poweradd includes a two years warranty to protect you against any manufacturer defect. Therefore, you have no problem using this power bank. Let’s get a hold of the Pilot X7 and let’s charge our way to Mars. Beating the 20000mAh capacity mark is the power bank charger from RAVPower. We are talking of a brand that specializes in producing these types of gadgets. The USB C-Power Bank Charger from RAVPower features a 20100mAh massive capacity charge power. The charger uses a 3.0 Quick Charge Technology to charge devices faster than most standard chargers in the market. Whatever the device you can think of, this power bank is capable of charging it even faster. The company has a wide array of excellent power bank chargers, and this is one of them. The body of the power bank is black, and the size at 6.77 x 3.15 x 0.79 inches in dimensions makes it very compact. Therefore, you can take this power bank with you in your luggage on the plane or just about anywhere. The only thing is that the C port is not compatible with Samsung A series phones. Nevertheless, it does what it is supposed to do—charge fast and last longer. High-speed recharging has never been this easy using the Anker PowerCore Power bank. This is a power bank that is capable of producing a massive 26800mAh capacity charging. It features dual inputs parts consisting of 4A max inputs. By this, you will be able to attain full charge in a matter of 6 hours. The Anker PowerCore power bank features 3 outstanding USB ports. Each of these ports carries the Anker’s IQ technology that aids faster charging. No matter the phone type, this massive 26800mAh capacity can charge them easily over 6 times. Also included is Anker’s MultiProtect feature that enables your devices to charge without getting damages in any form. More than 20 million people are using this power bank; you shouldn’t be an exception. Anker returns with another superb version of its PowerCore series of the best 20000mah power banks. To say that this is exceptionally lightweight is like calling a CAD paper heavy. At 11.4 ounce, this power bank is like a small can of soup. However, the only thing available for your device to feed is your battery time. The battery inside this power bank charges faster than most standard chargers in the market. Although it doesn’t charge quite as fast as its PowerCore 26800mAh sister version, it has excellent charging speed as well. The power bank boasts enough power inside it that can keep your devices busy for days. This version has an Anker VoltageBoost and PowerIQ for rapid charging of your devices. So if time is a factor for you, then go for this charger. Moreover, Anker designed it to support most of the devices out there. It will charge your iPad twice as fast and your Galaxy S6 devices five times. Of course, not forgetting Anker’s MultiProtect tech, which protects against all forms of charging problems? The battery cell protection ensures maximum temperature control, safety against short circuits and stabilizes the output current. With such quality inputs, it is not surprising that more than 10 million people are currently using this power bank. When you want to buy yourself a 20000mAh power bank, here are some few things to consider. One of the most important things to consider when buying a power bank charger is the number of ports it offers. The port is where you plug in your device to charge. Some 20000mAh capacity power banks come with one port. Others come in two ports while some few ones come in three ports. Each of these has their advantages and disadvantage. While a one-port power bank will cost less, you will only be able to charge one device at a time. A two or three port power bank will enable you to charge more than one devices at a time. However, they tend to be more costly and problematic on the medium to long-term basis. Yes, this is perhaps what makes the power bank important. Typically, power banks with 20000mAh power capacity are famous for their high-speed charge rates. However, other models in the market even perform faster and better. For instance, the Anker 26800mAh capacity power bank works faster and last longer than the standard 20000mAh power banks in the market. Others are in the range of 20100mAh, 26400mAh, and more. You can choose the one that suits your budget and needs. Forget about brand names; what is important is what the product does, not what the manufacturer looks like. Yes, while a good name tells of a brand that has carved a niche for itself, we can agree that sometimes, even the best brands produce junks. Therefore, when searching for the right 20000mAh power bank, look at what the customers are saying and not what the company put out there. The majority of the 20000mAh power banks in the market support many of the modern day devices known to man. However, bear in mind that some power banks support more devices compared to others. 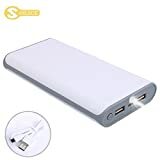 So, before you make that purchase, first make sure the power bank support the devices you aim to connect to it. That is all you need to know about 20000mAh power banks buying the guide in 2019. 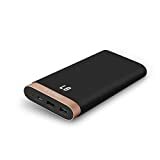 If you need the best 20000mAh power banks in 2019, just abide by our reviews, and you will be glad you did. These are not by any means all that is there in the market, but they represent some of the best. We welcome suggestions and ethical questions. Drop yours on the comment sections below.